Maggie Stiefvater's Wolves of Mercy Falls trilogy has been an interesting ride for me, as each book seems to give me a completely different opinion from the others. I wasn't quite sure what to expect of Forever, but I prepared for the worst. Sam and Grace's relationship has become utterly complicated. The tables have turned as everything they've been fighting for is at greater risk than ever. Now, they have to worry about even more than their relationship and life together being possible. They also have to worry about the entire pack staying alive in this great climax of their story, which brings an entirely new intensity to the Wolves of Mercy Falls trilogy. That's right, I said intensity. If you read my reviews of the previous books in this series, Shiver and Linger, you'd know that I've had issues with the corny/gushy feel of the characters in these books. In Forever, this isn't really a problem. Sure, it's still a bit gushy to begin with, but I think all the good of this book outweighs any corny moment there might have been. Once again, Cole and Isabel narrate as well as Sam and Grace. But, a fifth narrator has a small chapter. The first chapter. And I'm not going to say who it is, but I will say that this first impression left me rolling my eyes. I said to myself, "Well, I know where this is going." But I didn't. I was expecting the corniest, but I didn't need to. Thank goodness. Anyway, I still loved the multiple narrations. In other words, I still loved Cole and Isabel's story. Each character had his/her own voice, and Cole's made me giggle at times. For whatever reason, I just enjoyed his idiosyncrasies. Isabel, on the other hand, made me feel incredibly sympathetic. After all this time, these past events have really taken a toll on her. She's still uniquely Isabel, and that's why it hurt to see her hurt. I must say that I enjoyed reading about Sam and Grace much more in this book since everything became so serious all of a sudden. The sweetness of their relationship is still there, but their struggles have increased, giving them more to worry about. Plus, Grace's friendship with Rachel really shined, which I didn't expect (especially now, of all times, amid all the chaos in the world of wolves). It made me happy to see this. While reading Forever, Sam was the turning point. There was a part in this book where I immediately knew I would like it much more than the past two of this trilogy. A flashback of a grieving boy and Beck. I've mentioned in the other reviews that part of the reason I'm so drawn to Sam is because of his awful past. Who wouldn't feel terrible for the guy? And people seem to define him by that constantly. With Sam, there's always thoughts of Beck, and even their father-son relationship is tested in this novel, which really grabbed me emotionally. Even so, what stood out the most about Forever was the climax. Seriously, this is one of the best climaxes I've read about in a long time. The action jumped off the page, and the grief jumped into my heart. A couple of twists made my jaw drop as I read. Really, readers will have a sense of what the characters will have to do to reach some sort of resolution, but I know I never imagined it would turn out like this. So, Forever surprised me. It was SO much better than the other two books in the series, and I was completely shocked by how much I liked it, even how much I liked the ending. There's still room for imagination, which some readers may despise, but I have hope in my heart for all of these characters because of it. To be entirely honest, I always thought this trilogy was overrated. With an ending novel like this... I reconsider. I can forgive what I didn't like in Linger, because this was so worth the read. I still have to read the last book in the trilogy. I don't know why I'm waiting so long! I loved Shiver & Linger. Plus, there was a massive cliff hanger in Linger. Thanks for the review! I'm glad to hear that you liked it. What is the mood of Forever exactly? I mean I've read the books many times over but I can't seem to pick it up. (Sorry this is so late!) Well, I always felt like there was this lighthearted feel to Shiver, but it seems to dissolve by the time we get to Forever... So honestly, I'm not sure. It's been a little while since I read it, and as I think of it now, I get this odd mix of hope and grief. So I suppose the mood is a combination of a dreary situation but a hopeful outlook, from what I remember. Is that how you see it too, or is it just me? I loved this book-the entire series. I have a huge love of wolves and their deep seeded loyalties. This series touched very true to that. 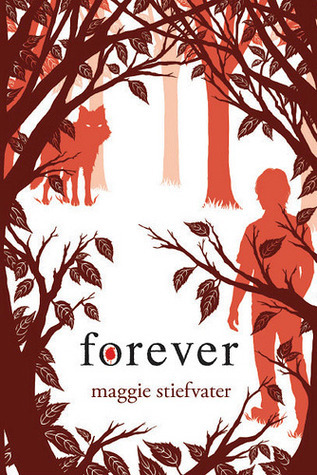 Thank you Maggie Stiefvater! !